Learn everything you need to know about this major in our free ebook. Download here! Key Program Features: Real-world experience, small class sizes, hands-on learning, professional opportunities, and an engaging faculty. The Hocking Medical Assistant program provides students with the knowledge to prepare competent entry-level medical assistants in the cognitive (knowledge), psychomotor (skills) and affective (behavior) learning domains. 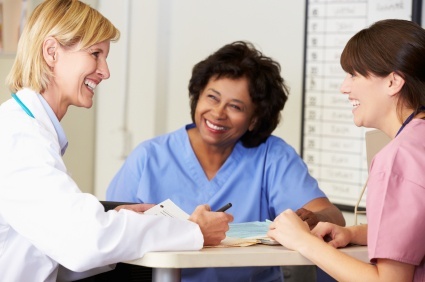 Medical Assistants are the only allied health professional specifically trained to work in ambulatory settings, such as physicians' offices, clinics and group practices. These multi-skilled personnel can perform administrative and clinical procedures. Performs a wide range of clinical skills to promote care of patients and families effectively. Conducts patient education to ensure continuity of care. Directs office business by performing a variety of administrative duties. Communicates effectively with staff, doctors, patients, community, and other medical personnel. Maintains professional skills and attitudes with colleagues and patients. Maintains, coordinates and documents policies and procedures for office. A Degree in Medical Assisting is HIRED Education. Graduates of the Medical Assisting Program at Hocking College showed 100% graduate satisfaction rate over the past five years. Employers who have employed Hocking College Medical Assistant graduates showed 100% satisfaction rate over the past five years. The Job market for Medical Assisting is excellent. 88.00% reflects the percentage of graduates who chose to seek employment in their field. The Medical Assisting Program at Hocking College has an average retention rate of 65.35% for the past five years. There are a number of support services available to students so that they can successfully complete the program. The Medical Assistant program is accredited by the Commission on Accreditation of Allied Health Education Programs (CAAHEP) upon the recommendation of the Medical Assisting Education Review Board (MAERB). Graduates of CAAHEP-accredited Medical Assistant programs are eligible to sit for the National Certified Medical Assistant CMA (AAMA) exam. The MAERB Annual report for 2017 indicated an 84.44% passage rate for those who chose to take the exam. The percentage far exceeds the 60.00% threshold set forth by MAERB. *Current graduating class in progress of completion. Hocking College Reserves the right to modify curricular requirements, to change course content, and change course fees at any time. Interested in becoming a medical assistant? Download our e-book for everything you need to know about this rewarding field. Student Learning Outcomes (SLOs) are statements of what a student will be able to do when they have completed a program. They represent the knowledge and skills a program has determined are most important for students to gain from that program and include both the Success Skills (institutional outcomes) and Program Outcomes. SLOs are specific and measurable so the program can accurately assess the degree to which students have achieved each outcome, and they align with college and institution mission and values. Data on the achievement of SLOs is used to make improvements in the program and increase student success. To learn more about each of these, click here. All registered fall/autumn students with registration status for the following fall/autumn. Excludes special populations - College Credit Plus, Non Degree, Online Military and University Center. Potential for upcoming fall/autumn excludes graduates from that fall/autumn, spring and summer terms. For the purposes of reporting, the program completion rates are aggregated by academic year of entry. A student is considered to have completed or graduated from a program or certificate by virtue of having been awarded the degree or certificate. A student is considered to be undertaking activity in a program of study for the duration of time that they are in an active status in a program or certificate. This is defined by having a Program of Study with a status of ‘A’ during the duration of time they are taking coursework. Should a student move in and out of active status in a program of study while continuing to take coursework, we only take into account the student’s activity while the program has an active status for that particular program of study. Starting the next phase of your life through education may seem daunting. That's why we're here to help every step of the way.